Realty research firm Liases Foras launched its Real Estate Sensitivity Index – RESSEX,( www.ressex.com ) that will provide structured data and property analysis on the country's real estate market. 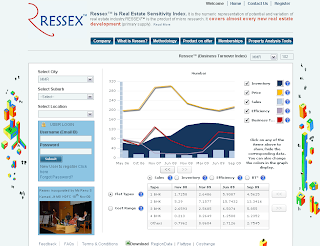 RESSEX is a product of detailed micro research, which covers every new real estate development excluding secondary supply and enables the user to view the market potential in both micro and market perspectives in the form of an index. Besides prices, the index comprises sales, inventory, business turnover and an efficiency index, HDFC Joint Manging Director, Renu Sud Karnad, said while launching the index here. REESEX has been developed to be a source of immense data to developers investors, banks, housing finance companies, FIIs, private equities, analysts and others in their decision-making process, Karnad said. "RESSEX will enable easier understanding of the finer aspects of the dynamics of real estate trends," Liases Foras's MD, Pankaj Kapoor, said. The index covers almost every single primary real estate supply across six major Indian cities – Mumbai Metropolitan Region, Pune, NCR, Bengaluru, Chennai and Hyderabad, he said. Basic quarterly data for each of the cities covered is available for free after registration on the company’s website ( www.ressex.com ). The company charges a fee of Rs25,000 per quarter for more detailed data, which includes area-wise information on prices, sales and demand in a particular city. Many first-time investors make glib references to the tax advantages that attached to property investment but a few simple points still need to be clarified. In this article will examine the important taxation considerations of property investment including negative gearing, depreciation, capital gains tax, and how tax benefits can make your investment pay. Thanks for the information you have provided. In present days, the demand for real estate properties has increased in Hyderabad and it is the best place for the investors to invest in real estate activities.